Gain the Eccentric Resistance Advantage with Eccentron. Negative Resistance for Better Outcomes. Built on years of Research & Development in the growing field of eccentric resistance training, BTE Eccentron is THE eccentric resistance strength trainer with objective measures and results tracking. Helping clinicians deliver better outcomes, faster. Eccentric exercise – muscles lengthening under force – has long been recognized as highly effective by Orthopedic and Physical Therapy thought leaders. But until now, there wasn't a proven device to deliver the benefits of eccentric resistance in a safe, closed chain manner. From objective evaluation to the interactive rehabilitation experience. Nothing gives your patients more and elevates their evaluation and rehabilitation outcomes and experience like giving them the benefits of a BTE. Your patients will thank you. Nothing makes a statement about your commitment to delivering the utmost in patient care like a BTE. Nothing sets you apart from the competition and plants a bold flag of excellence like upgrading your clinic to BTE. Don’t take our word for it. Hear it from our clinical users. 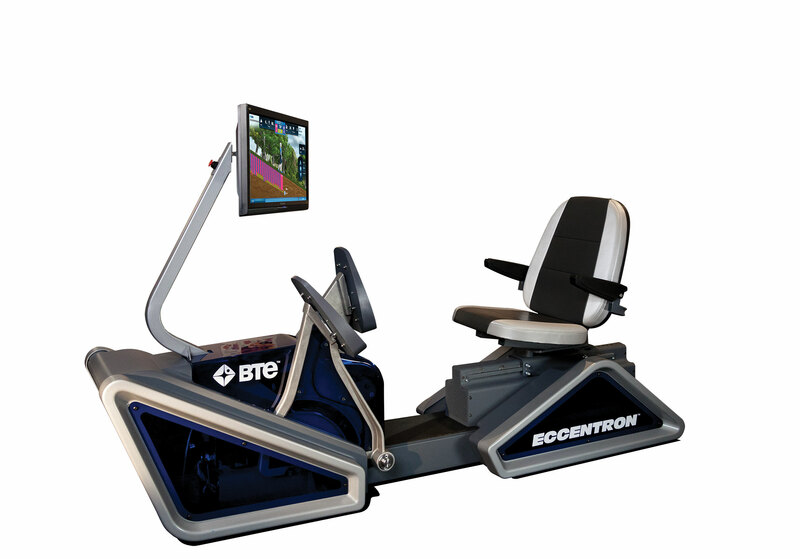 Find out why BTE is the go-to provider for the most accurate, objective, and functional evaluation and rehabilitation. Get the power of Eccentrics. For your whole practice. Controlled dosing and single leg tracking allow for optimal closed-chain treatment for General Rehab. Safely increase strength and stability for improved balance, mobility, and decreased fall risk for Geriatrics. Enhance Athletic explosive power and performance. And provide effective strengthening for Cardiopulmonary patients with low cardiac output. Higher Resistance Capacity. Low Oxygen Requirement. Eccentric training offers several distinct clinical advantages. Like Higher Resistance Capacity. The body can resist 30-40% more weight eccentrically than it can push, concentrically. And Low Oxygen Requirement. 80% less O2 is needed, due to muscles resisting rather than doing concentric work. Eccentric training delivers all of these benefits, with the added benefit of lower perceived exertion. Engage and Motivate Your Patients. And Keep Referrers Happy. Start Post-Op Rehab Sooner. For Better Results. Eccentron gives you the ability to get your patients moving sooner – post injury and post surgery. Unique, controlled dosing features give you the power to dial in safe, low resistance targets – to start rehab very early. Preventing atrophy, and making significant gains without intense aerobic activity or high impact exercise. Ron Courson, Director of Sports Medicine for University of Georgia, reflects on his success rehabbing Todd Gurley, helping him overcome adversity on his path to the NFL draft and winning 2015 NFL Offensive Rookie of the Year. We have a library full of additional resources about Eccentron. Access the Document Library to download more content.